Something unusual happened with Tesla Inc. (Nasdaq: TSLA) last week. On Thursday, the company unveiled the Model Y — a brand-new crossover SUV electric vehicle. Given that Tesla has long been a company driven by hype, you’d expect the stock to rally on such news. After all, its shares have surged on missed production numbers before. Bulls are often distracted by shiny new improvements to existing production lines, or the announcement of artificial intelligence improvements, or even new product lines that are potentially decades down the road (I’m looking at you, Tesla A.I. semitrucks). But, on Friday, TSLA stock fell more than 5 percent. That, in and of itself, is telling. Tesla released a shiny new product — and the stock fell. But the brokerage community isn’t the only group souring on Tesla. The financial media has also moved on. Turning to TSLA’s price action this year, the impact of this rise in negativity is clear. TSLA stock is trending obviously lower. The shares have set a pattern of lower highs and lower lows dating back to December. Additionally, its 50-day and 200-day moving averages have once again completed a bearish cross known as a “death cross.” The last such cross pushed the shares down to their 2018 lows near $250. 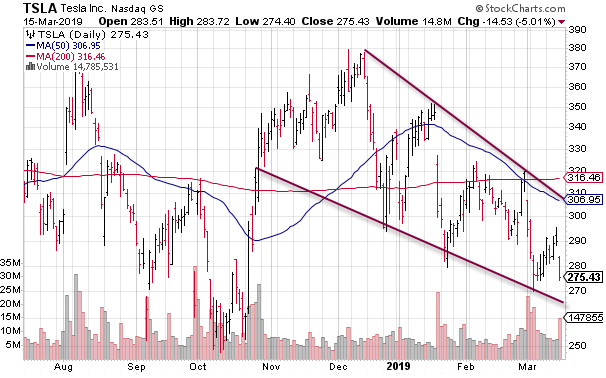 It appears that TSLA stock could be due for another test of the $250 region in short order — especially if the company’s next production update falls as flat as the Model Y release. Tesla had long been a company of hype. A company that’s stock rose and fell (but mostly rose) sharply on the excitement of new products and gigafactories. A company with investors that hung on CEO Elon Musk’s every word. But those days are gone, and the market may finally be over its infatuation with Tesla. For Tesla bulls, this means the ride is about to get a lot bumpier.